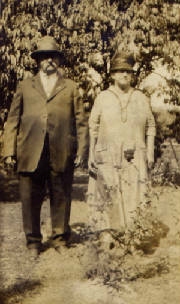 Our TAFEL family begins with Albert Tafel and his wife, Mary Elizabeth Wolf. Nothing is known about Albert and Mary's early life although we can speculate about some things. Albert was born in Germany, May 12, 1832. He and two of his brothers immigrated to America abt. 1850 and settled in Tell City, Indiana. On October 30, 1856 he married Mary Elizabeth Wolf who was born, December 17, 1837. Albert died July 15, 1899, Evansville, Indiana. Mary died, December 15, 1916, Evansville, Indiana. He served as a Bugler in the Civil War, FIRST CAVALRY, 28TH. REGIMENT, discharged March 16, 1863, disability. He provided a sustitute in 1864. FROM BURCH & POLK'S EVANSVILLE DIRECTORY, 1871-72, LISTS, ALBERT TAFEL, LABORER, RED: E. 5TH. AVE. BETWEEN 3RD AND 4RH. STS. -m- (1) Mary Pinstrup in 1884. (2)Louisa Schick, Nov. 12, 1885 (3) Katherine Reich/Ruff in 1890. They lived in Tell City, Indiana. Katie was born, Oct. 1870, IN. Peter Louis- Born: Sept. 2, 1891, IN. Albert: Born: Oct. 10, 1894, IN. Mildred/Marie: Born: Aug. 21, 1908, IN. -b- Sept. 16, 1860 -d- March 22, 1931, (Daughter of: Heinrich Gotfried Kirves & Amelia Kaiser. 4. FRANK Tafel -b- Feb. 29, 1864 -d- Dec. 5, 1881. 17 YRS. 9 MO 16 D.
BURIED: OAK HILL CEMETERY, (never married) Killed in coal mining accident. One day, while walking past a local market in Evansville, George was struck by the beauty of a wheelbarrow full of cabbage sitting on the sidewalk. He walked past, turned and walked back, all the while wrestling with the demons which had taken hold of his senses. George lost the battle of wills with himself and before he knew it.....he was wheeling that precious cargo down the street toward home. He had only been home a few minutes when there was a knock at the door. Peeking out through the curtained window, George's worst fear was realized.....The police had already tracked him down. Now, we said he was a scoundral but we didn't say he was stupid and you have to give him credit for quick thinking in a dangerous situation. He had a plan! George quickly ran to his wife's closet and choosing a dress and bonnet, proceeded to change clothes. Wearing this dress, bonnet pulled down low over his face, he walked out the door, nodded his head in greeting to the policemen and walked right on down the street. I guess it didn't take the local law enforcement long to realize they'd been duped and before long, George was taken into custody. He ended up in the Indiana State Prison for that stunt. Finally fed up with her husband's foolish ways, Amelia divorced George while he was serving his sentence. When he was released his charm won her over again though and they re-married soon after. 1860 INDIANA CENSUS, VANDERBURGH CO.
INDIANA STATE PRISON, MICHIGAN CITY, LAPORTE CO.
1920 INDIANA FEDERAL CENSUS, EVANSVILLE, IN.